In my country, the only way a racing driver can make the “mainstream” news is by being in Formula 1, and/or dying in a crash. 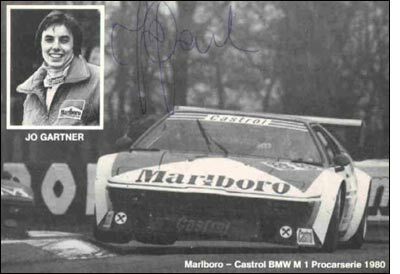 On Sunday, June 1, 1986, shortly after 3am, Josef “Jo” Gartner lost his life on the Ligne Droite des Hunaudières at Le Mans. At 7am that day, I woke up and heard the news on the radio. Forgive me for writing myself at age 15 into this story; but you see, this is personal. I do not think I have ever idolised anyone - but in many ways, Jo Gartner came closest. At the time of his death, he was 33 years of age and had just begun his second decade as a racing driver. Before he began driving racecars, he designed them. A graduate of the Vienna Technical College, he went into the services of Kurt Bergmann in 1972. From his shop on the outskirts of Vienna, “Master” Bergmann had conquered the Formula Vee and Super Vee universe with his Kaimann cars, a “garagiste” if ever there was one. Much to his dismay, his young engineer, and chassis wizard, developed the ambition to drive these cars himself, rather than build them for others. In 1976, “Jo. Gartner” (his first name abbreviated so it would fit on his overalls) entered in his first hillclimb, finished the first heat in second place, and the second heat in the greenery. School fees. From then on, he never looked back, in part because he didn’t have the time to stop and turn around. Two up-and-down years in Super Vee, followed by a dismal season in Formula 3, with Renault works engines that turned out to be duds; then the move into Formula 2. He was up against several fellow countrymen at the time: Walter Lechner (father of Walter jr. and Robert, and now himself a successful team owner), Markus Höttinger, Gerhard Berger. They were opponents for sponsorship money and media attention in the small Austrian market, scrambling to get whatever headlines and funds became available through the retirement of “Niki Nazionale” Lauda. When The Rat returned and once again stole the show, the struggle became even fiercer. Yes it was all about Formula 1 back then, as it is now. With hardly any information about other forms of racing to be found anywhere in the media, I was all about Formula 1 too. As of 1980, Gartner toiled away in Formula 2, his own team owner and chief engineer most of the time, redesigning first a Toleman chassis (1981), then a Spirit (1983) and campaigning them under his own banner, as well as doubling as performance driving instructor and writing car reviews for a newspaper – three lives rolled into one. A year with the Merzario team was cut short by poor results and ever-growing “artistic differences”, and is best forgotten. In 1980, the Procar series for (supposedly) identical BMW M1 supercars was in full swing. To replace Markus Höttinger, who had died in an F2 accident at Hockenheim, Dr. Helmut Marko signed Gartner up for his Procar team. Their personalities did not mesh. Helmut Marko, power broker: best known these days as the man behind the motorsports activities of Red Bull, he was already an influential man back then. A notoriously hard taskmaster, and a man you did not cross. If you had to have the last word against Marko, that word had better be “yes sir”. At the abrupt end of their working relationship, Marko and Gartner were not on speaking terms; Marko later firmly sided with Gerhard Berger, in his bitter rivalry with Gartner over that elusive F1 drive. Berger later called this period, and what went on behind the scenes, “ridiculous”. Back then, nobody was laughing. In their constant fight for funds and media airtime, for The Drive, no holds were barred. 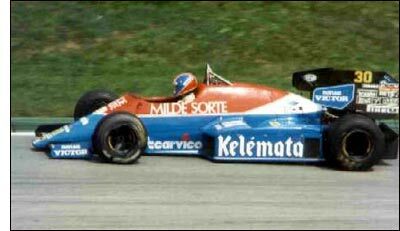 Both eventually got their chance in Formula 1; while support from BMW got Berger behind the wheel of a BMW-engined ATS, Gartner bought a ride with the troubled Osella team. Whenever he managed to qualify, Jo was relegated to also-ran status with the aging F1 rental car. He did manage to shine: the 1984 Italian Grand Prix at Monza saw Jo Gartner cross the finish line in fifth place, on his last drop of fuel, demoting Gerhard Berger to sixth spot, while Lauda won. Don’t look for it in any race results or points tables, though: as he hadn’t been nominated by Osella before the start of the season, Gartner was ineligible for points. After the last race of the year, the Portuguese Grand Prix, where Lauda snatched the title away from Alain Prost by that famous half-a-point (I was in Paris at the time, fairly alone in my delight), Gartner and Berger both scrambled to get the vacant seat at ATS for the next season. Berger made it, Gartner was never to return to Formula 1 again. It was time for Plan B, and this included sportscar racing. 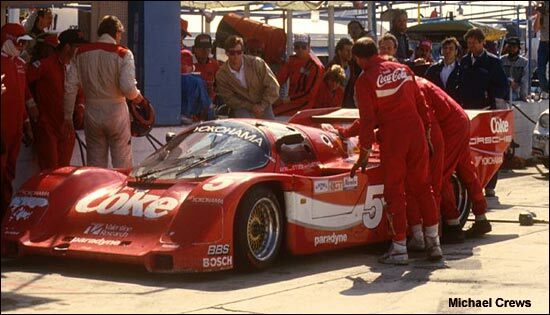 Although he only ever drove nine races in Group C and IMSA GTP, and at least initially only saw endurance racing as a stopgap before another assault on F1, it was probably a happy time for Gartner; he got paid for driving, he didn’t have to worry about car engineering and preparation (although more often than not, he did), and recognition came. His best result in 1985 was third place in the Silverstone 1000k, with Tiff Needell, for the Porsche customer team of John Fitzpatrick. At Le Mans, Gartner and veteran David Hobbs shared the driving between them for most of the race, after Guy Edwards had proved too far off the race pace; they finished fourth. “Daytona had shown the Marches to be considerably more fragile than the Porsches, and the rougher Sebring track was not expected to compensate for it being a shorter race. It was unlikely that one of these would survive at the front, despite Whitney Ganz taking the pole in Phil Conte's Buick powered car. The Brun team was not present but the European entrants were represented by Jöst, which along with the Corvette GTP, became an early retirement. The two Jaguars were trying to keep to a strict pace, which backfired on them when the Porsches proved too quick and both XJR-7s retired during mid-race. It was thus clearly another inter-Porsche squabble. The principals were the Daytona winning trio of Holbert/Bell/Unser, Jr., Akin/Stuck/Gartner (above), Drake Olson / A. J. Foyt, and the second Busby car of Brassfield/Morton. The car's owner also did a stint in this car. However, after misjudging a maneuver past a back marker, hitting a tire wall, and breaking the car's nose, Busby decided to let the two professionals handle it the remainder of the day. A more permanent stop was made earlier by the Leven 962, which had a broken head stud. Holbert quickly pulled out a sizable lead from the start of the race, and a few laps later he began to shift earlier, select taller gears, and generally settle into a reduced pace for the long haul. He even allowed the John Paul, Jr. / Whitney Ganz March to usurp the lead until a minor problem dropped them back to third. The Buick recovered enough to give the team a good long spell among the leaders until finally giving up in the eighth hour. Al Holbert's car made a couple of extended stops to deal with a brake line problem, which allowed Hans Stuck / Jo Gartner's Akin entry to catch them. The conservative approach taken during the opening hours was forgotten as these two went wheel-to-wheel for a long time. Defending co-endurance champions Stuck and Bell were in opposing cars and greatly enjoying the opportunity to race one another. The interim decision went to Stuck when Bell chose the wrong moment to glance in his mirror. When his gaze went forward again, he found the next turn approaching him a little too rapidly. The car had little damage and soon returned to the fight. A. J. Foyt had been having a tougher time while mixed up with tail-enders; the hard knocks had begun to loosen enough components to eventually retire the car. Following the delay of the Holbert/Bell/Unser Jr. team, the Brassfield/Morton 962 of Jim Busby broke off its second nose piece. It was left lying on the track at Turn 11, requiring a caution period to remove it. The Akin/Stuck/Gartner Porsche was beginning to build a lead that looked impregnable as the night time hours ticked by. Stuck had a bout of misfortune/fortune when a wheel came off. It happened just before the entrance to the pits so a quick stop resulted in little delay. However, the errant object struck Jay Jensen of Jim Downing's GTP Lights crew, giving him a concussion. […] Meanwhile, back at the GTP front, the Akin car continued in first place while the Busby 962 damaged yet another nose piece. By now the front of the car was so battered that the fiber glass section couldn't be undone. Darin Brassfield was sent back out in "as is" condition. Some time later he did the pit crew a favor by hitting a back marker and completely dislodging the piece--honest, it was an accident. The Holbert team could only capitalize briefly on the Busby car's troubles, as suspension breakages destined them to a distant third place finish. 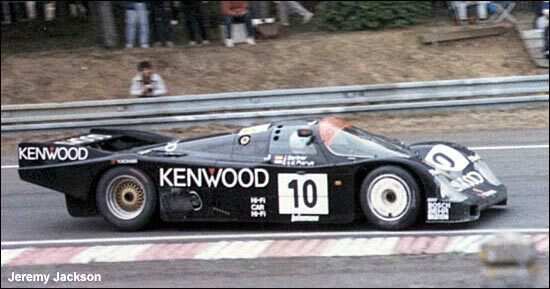 Then it was on to Le Mans: amid talks about a possible Porsche factory drive (in 1987), Gartner drove the 1986 24 Hours for the Kremer team, with partners Kunimitsu Takahashi and Sarel van der Merwe. I have heard a number of different reasons given for what happened that night on the Hunaudières – a suspension that had been fixed earlier in the race finally giving in under the stress; the modified underbody playing havoc with the car’s aerodynamics; a broken gear selector failing to disengage fourth gear as Jo changed up into fifth – and I confess that it doesn’t make much of a difference to me. The ill-fated Porsche’s chassis number was later assigned to a new tub; sadly, you cannot do that with people. Someone I admired for his resilience, resourcefulness, and his refusal to quit, was gone. Following his success at Monza in ’84, Jo got quite a bit of media attention over here in Austria; among several other things, he got to do a prime time radio show. While he came across as a dry engineer in interviews, he impressed more than a few people, talking for an hour or so about his life as a racing driver, and life in general. His sense of humour came across, too: when he mentioned his family’s auto repair shop in Vienna, he followed it up with “Joe’s Garage”. Today, Jo’s garage still exists, not far from where I sit now and write this text which, I fear, is getting far too long; I pass by it every other day, and it serves as a reminder of June 1, 1986 - the day Jo Gartner, sadly, made the headlines.